As the worlds of health care, research and higher education undergo seismic economic shifts, UC San Francisco is uniquely well positioned to excel and even capitalize on the changes, University leaders say. UCSF has an increased focus on its long-term financial and business planning, the details of which are spelled out in a new 10-year financial plan prepared by the University. It combines the medical center and the campus’ current and projected financial plan for the entire $4.14 billion enterprise. The good news is that UCSF’s current financial performance exceeds projections that had been made for 2013, and the University continues to maintain a strong balance sheet, with $2.1 billion in cash and short-term investments and a projected increase over the next decade. Maintaining a strong bottom line allows the University to invest in capital projects and programs, buy new equipment and recruit top faculty. UCSF is prepared for the challenges ahead and is taking proactive measures to ensure it continues its mission of advancing health worldwide while maintaining its commitment to the highest standards of excellence across research, education and patient care. “We are in control. We understand the financial picture and we are in a good position for the future,” says Sam Hawgood, MBBS, dean of the UCSF School of Medicine, who will become interim chancellor of UCSF on April 1, when Chancellor Susan Desmond-Hellmann, MD, MPH, becomes CEO of the Bill and Melinda Gates Foundation. The University of California Regents approved the longtime UCSF leader to serve as interim chancellor while a national search is under way for Desmond-Hellmann’s permanent replacement. Hawgood says campus leaders share a common vision that will enable them to confront the challenges ahead. “We have the tools, we have the data, and we are well-positioned, provided we make the right strategic decisions,” Hawgood says. That strategy is taking shape both for the big picture or long-term planning effort now underway, called UCSF 2.0, which will guide UCSF over the next decade, and the short-term clinical enterprise strategic plan that will require the medical center — like never before — to demonstrate its value as a provider of high-quality, cost-effective care. Importantly, UCSF’s strategic priorities in support of patient care, research and education drive the financial planning process and decisions about how central resources are spent reflects the input from campus leaders and major stakeholders across the University, says John Plotts, senior vice chancellor of Finance and Administration. Plotts says it’s important to be straightforward and transparent when communicating the financial challenges and opportunities ahead to faculty, staff and students. Without a doubt, all members of the UCSF community will need to do their part to meet the financial challenges of a dynamic and highly competitive marketplace, Plotts says. Read more. While the 10-year operating projections show near-term deficits, they also anticipate recovery in subsequent years as the University adapts to an uncertain marketplace with continued expense control and enterprise-wide solutions that leverage talent, capital, space, and other assets. About 80 percent of UCSF’s $4.14 billion revenue for 2012-2013 comes from or is dependent upon competitive and rapidly changing markets. 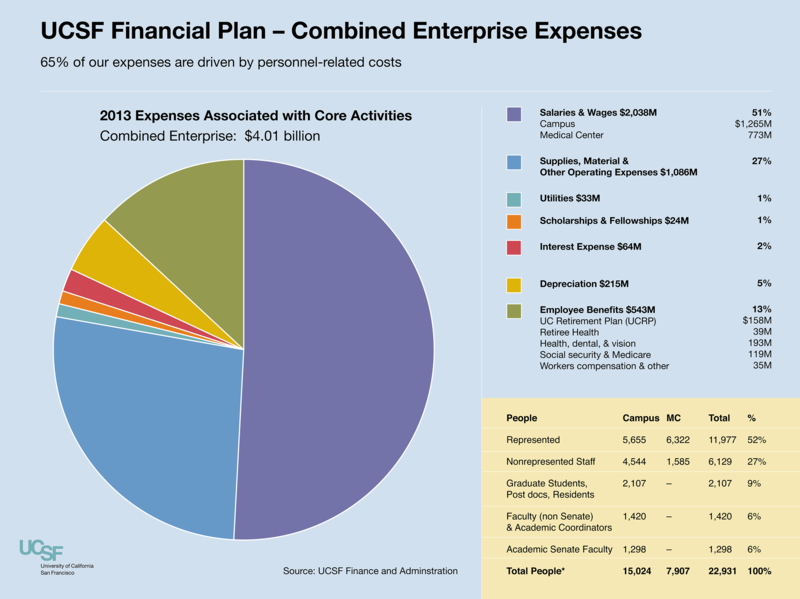 The financial health of the clinical enterprise (which includes UCSF Medical Center, UCSF Benioff Children’s Hospital, Langley Porter Psychiatric Institute and outpatient clinics) is extremely important to all of UCSF as it accounts for more than half of all revenues, or $2.164 billion, which includes millions that are invested across the campus every year. And while UCSF has been able to trim its operating costs in recent years, 65 percent of UCSF’s costs are personnel related: more than $2 billion in salaries and $543 million in benefits. Personnel costs, in particular the cost of pensions and other retiree benefits, are expected to rise over the next decade, outpacing the relatively modest projected revenue growth. 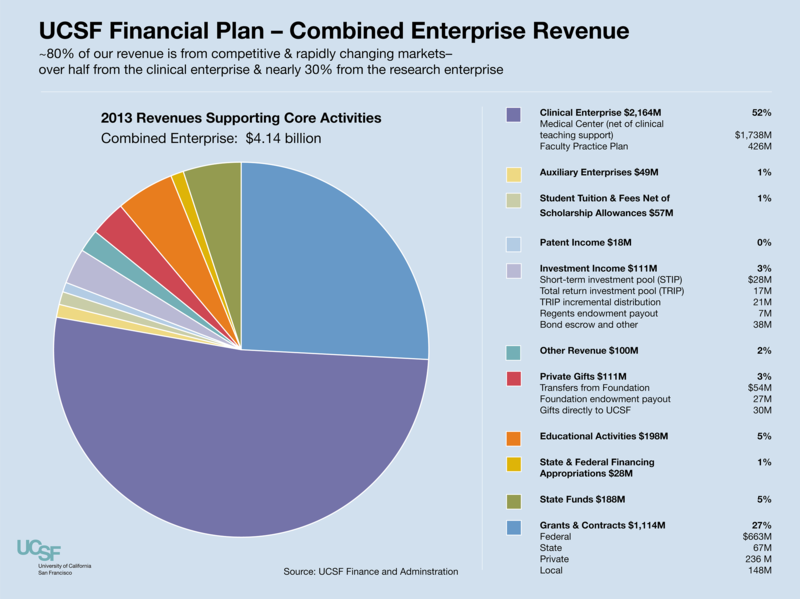 The research enterprise contributes $1.1 billion, or 27 percent of UCSF’s budget. This year, for the first time, all four UCSF schools — in dentistry, medicine, nursing and pharmacy — ranked first in funding from the National Institutes of Health (NIH) for research. UCSF received more than $517 million in total through contracts and grants in 2013, enabling scientists to continue their pioneering efforts to understand the underlying causes of such diseases as cancer, heart disease and diabetes, and work to develop improved therapies for them. Read the news release. UCSF can credit its relative success in NIH funding to its researchers submitting increasing numbers of grant applications, as well as to the high caliber of UCSF’s research and grant application scores. But the political climate in Washington D.C. that led to sequestration in 2013 forced the NIH to cut $1.55 billion from its budget, which was already showing signs that two decades of steady growth had ended. The cuts were felt immediately. Federal research funding overall at UCSF stayed flat in 2013, while the UC system as a whole dropped 12 percent, or $345 million. Sequestration took a toll on faculty and students at UCSF. In a survey of UCSF faculty conducted in July 2013, two-thirds of respondents reported significant cuts to their existing federal award or contract. Additionally, 62 percent instituted hiring freezes in their labs and nearly 30 percent reported layoffs. Even without sequestration, research universities can no longer count on a steady increase in NIH grants and must look to new sources of funds. Similarly, California’s beleaguered state budget continues to fund a smaller percentage of UCSF’s budget, now just under 4 percent. UCSF Medical Center, which accounts for more than half of the University’s budget — $2.2 billion out of $4.1 billion — must adapt to new forces both internal and external. Implementation of the federal Affordable Care Act (ACA) will exert pressure on all hospitals, including UCSF’s, to rein in costs and provide increased access to services. And with UCSF opening a new integrated hospital complex for women, children and cancer patients in Mission Bay in February 2015, the medical center is projecting an increase in its operating costs but does not anticipate a corresponding increase in revenue for several years. While campus leaders anticipate the hospital will once again operate in the black in a few years, the medical center has implemented cuts in recent years to prepare for the lean times ahead. Last year, the medical center reduced its full-time equivalent staff by 300 positions, some due to layoffs and others by not filling vacant jobs. To prepare for the challenges ahead, Hawgood and Laret are leading a clinical enterprise strategic planning effort, which is a three-pronged approach to managing the medical center in the next few years. The plan involves achieving efficiencies and improving health and safety of patient care; establishing destination centers to market UCSF’s clinical areas of excellence, such as organ transplants; and pursuing relationships to create a broad network of providers, such as its recent affiliation with Children’s Hospital Oakland. Read more. The UCSF School of Dentistry also is adapting its clinical activities to compete in the ever-changing marketplace. The UCSF Dental Center runs 18 clinics, accounting for 120,000 patient visits each year, and $25 million in revenue, according to UCSF School of Dentistry Dean John D.B. Featherstone, MSc, PhD. While revenue is up 30 percent over the past five years, Featherstone says the clinics are looking at ways to increase those revenue streams. John Ford, vice chancellor of University Development and Alumni Relations, says the financial challenges should not dampen anyone’s spirits, because UCSF has much to be proud of — including its role as the birthplace of the biotech industry, a faculty that boasts five Nobel laureates among hundreds of renowned researchers and clinicians, and thousands of patients served at its first-rate hospitals, with treatments developed in its research labs, and by graduates of its top-notch educational programs. Philanthropy will play a more vital role than ever before in helping UCSF realize its vision of becoming the world's preeminent health sciences innovator. Already the University has raised $450 million towards its $600 million goal for funding the new 289-bed children's, women's and cancer hospital complex at Mission Bay, a $1.5 billion project. That includes $100 million from Salesforce.com founder Marc Benioff and his wife Lynne, and $50 million announced in January from Intel co-founder Gordon Moore and his wife Betty. In the past, philanthropy has been important at UCSF, but was more “icing on the cake,” because of such strong support from government sources, Ford says. Now UCSF must join other major public universities, from UC Berkeley and UCLA to those in Michigan, Wisconsin, Virginia and Texas, in aggressively seeking large gifts. Having established a strong philanthropic track record in many of the capital campaigns in Mission Bay over the past decade, UCSF is now encouraging “more and more faculty to begin to think of private philanthropy for the funding of their programs,” Ford says. For deans, fundraising is part of the job. “It’s more important than ever before,” says Featherstone, noting that he spends about 20 percent of his time pursuing philanthropic efforts. The UCSF 10-year financial forecast tempers its frank assessment of the challenges of a changing world with positive signs that UCSF is working on multiple fronts to secure new funds to support its public mission. UCSF also continues to show its considerable public service commitment to the City. Whether it’s offering free health screenings or organizing a Bay Area wide science fair, UCSF has a major economic impact on region and the state. In a special report the University commissioned in 2010, Economic & Planning Systems Inc. of Berkeley found that UCSF generated more than 39,000 jobs and produced an estimated $6.2 billion economic impact when including operations, construction, salaries, and local purchases by employees, students and visitors. That figure has likely grown dramatically over the past four years, as UCSF continues to invest in the Mission Bay and Parnassus campuses. Bluestone says that the long-term UCSF 2.0 planning initiative includes a mandate to “be ecumenical in all areas,” and he points to collaborations not only among the schools, but also between the schools and the medical center to reinforce the “One UCSF” approach. “It’s a huge concept, and one we have to build upon more,” says Featherstone. Featherstone says the five deans — he along with Hawgood, Guglielmo, David Vlahov, dean of the School of Nursing, and Elizabeth Watkins, dean of the Graduate Division, — meet frequently as a group, look for areas of potential collaboration and mutually beneficial faculty recruitment, and help each other out whenever possible. The UCSF Program in Craniofacial and Mesenchymal Biology is a prime example; while the program is in the School of Dentistry, its director Ophir Klein, MD, PhD, does not have a degree in dentistry. The Center to Address Disparities in Oral Health — known as CAN DO — is a multidisciplinary effort including the schools of dentistry, nursing and medicine. The newly opened Walgreens store on the Parnassus campus is a venture among the School of Pharmacy and UCSF Medical Center. UCSF’s leadership in advancing the field of precision medicine also figures prominently in this “One UCSF” effort. Precision medicine is an emerging field that aims to harness technology, science and medical records to better understand the roots of disease, develop targeted therapies and prevent disease.